A tale of 20 students, 2 professors and over 2,000 years of French history! The group [minus Dr. Fowler, who stayed in Avignon] scrambled out of bed in time to make the 7:40am bus to Pont du Gard. The report was that, while it was a long day, the bridge and the surroundings were well worth it. Dr. Fowler promises to get up in time for this visit in 2007! 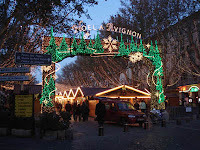 We will close the Avignon portion of our blog with a variety of images. First -- yes we did eat! 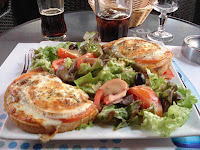 This is an open-faced "tartine" from Le Cid in Avignon. 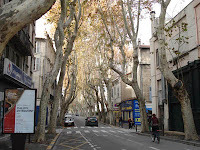 The view down this Avignon side-street showed the tension between a modern city and its trees, in this case the famous plane trees of Provence. Last, but not least, the Christmas Market FINALLY opened in the main square after our having lived with the preparations for 3 days! When we asked at the end of the trip which place had they enjoyed the most [other than Paris, of course ;)], almost everyone answered "AVIGNON!" 28 November, 2006: Arrival in Avignon!